The 2010 AHS home tour includes the 1911 Bayard and Ruth Pearson House, 1910 Seagroves Farm House, 1912 Hunt-Corti House, 1954 Tillerson-Allan House, the 1914 Union Depot at Salem and Center Streets and the Maynard-Pearson House at 1101 Olive Chapel Road. Bayard Preston Pearson Sr and Annie Ruth Sears Pearson built this house on a one acre lot in 1911. Bayard was a banker at Merchant and Farmers Bank in downtown Apex. In the early years the Pearsons used the home as a Tourist Home to accommodate travelers passing through, a very common practice of that era. Later the home was converted to a rooming house. Ruth was a very a creative woman and baked wedding cakes for the community, and later worked as a seamstress in downtown Raleigh. Baynard and Ruth had three children: Bayard, Jr, Ruby, and Frank. The children, along with numerous cousins enjoyed playing in the back yard, and watching the coal powered steam locomotives as they passed by on the railroad tracks which bordered the yard. One of the cousins, John W. Pearson, remembers the wonderful aromas of freshly baked cakes and cookies which came from Ruth’s kitchen. He also remembers her glass cabinets filled with little keepsakes (trinkets) popular at that time. Bayard Pearson passed away in 1950, and Mrs. Pearson passed in 1975. Bayard and Ruth’s grandchildren and great-grandchildren are still part of the Apex Community. The house has changed owners several times; the current owners, Doug and Cherie Gibson. purchased the house in 2007. They are restoring the home’s unique qualities, and reclaiming old architectural features. The Gibsons are planning to open their home as a Bed and Breakfast in 2011. 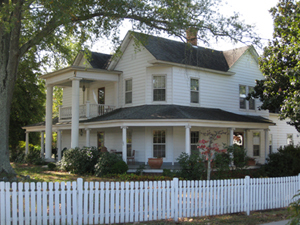 Built in 1912 by J. Dallas Johnson of Pender County, NC, this house was purchased by W. T. Hunt in 1913. Mr. Hunt added the two large front columns to support the roof over the second story porch. Otherwise the house remains unchanged from its original structure. Nancy Stolfo-Corti purched the house in 1997 from James and Diane Allen. Nancy added the large terra cotta (meaning cooked earth) urns on the front porch. The urns, which are lined with enamel, were used to hold Olive Oil. The first floor has a large living room containing family photos, a dinning room, new bathroom, and a updated kitchen with fireplace. The light fixtures are hand blown glass from Venice. The mantles are tiger oak. The heart pine floors have been restored to their original beauty, as has much of the interior trim. 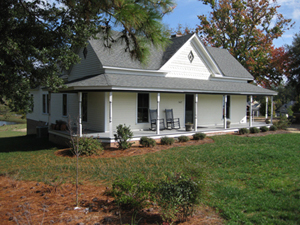 The second floor has three bedrooms, a bath and a large center hall leading to the front outside sitting porch. This craftsman style house, remodeled in 2008, was originally a 1954 ranch. Gerald Truelove, an outstanding builder of the period, was employed by H. L. and Evelyn Tillerson to custom build the original house. 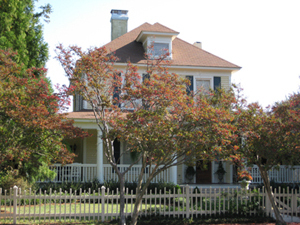 Gene and Wendy Allen purchased the house in 2006 from Mrs. Bertha Holt, and began an extensive remodeling project. The entire roof was removed so that a second story could be added. All of the hardwood floors on the first floor are original except for the kitchen area. The hardwood ceilings in the kitchen, breakfast nook, and laundry room are also original. The back area of the house, which was originally a closed in porch, has been converted into a laundry room/sunroom. Off of the sunroom a powder room was added, and the front porch was expanded. Originally the house had only a carport, so the Allens decided against a garage and redesigned a carport which matched the new exterior. People often ask the Allens, "Where is the old house?" To which they smile and reply, "It’s still inside." John Henry Seagroves, a tenant farmer, bought this 92 acre farm for $540 in 1904. In 1910, Seagroves and his wife, Nevada Pearl Mann, built this one-story house with a wrap-around porch. The Seagroves had 2 sons and 2 daughters. 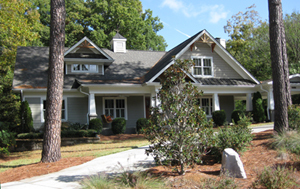 The home is typical of the style built locally in that era, the one-story triple "A" house popular in western Wake County in the late nineteenth century. The Seagroves grew corn, cotton and tobacco. One of the sons, J Q Seagroves, lived in the house until he married Margaret Jones Rogers in 1946. J Q and his wife then built and moved into a brick rancher behind the restored Seagroves Farm House. J. Q. is remembered by many long time residents of Apex as a rural mail carrier they "could set their clocks by." All of this property was later inherited by Lelia Seagroves Womble, the only remaining child at that time of John Henry and Nevada. 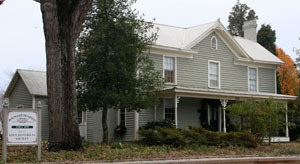 Bill Cotton of Cotton Custom Homes purchased the property in 2007 and restored the Seagroves House to be used as an office. The house, which was in bad disrepair, was moved to a new foundation, so that the road could be widened. A small park with an old farm pond has been preserved from the farm and is located directly behind the Seagroves House. The Town of Apex plans to make it available as a public park.